I am, like many librarians, sort of a crabby nitpicker about some things. I think there are optimal ways to do things, particularly with technology. I have, over the past 20+ years of helping people, gotten better at working with people to reach their own good place with how they want technology to work for them. I only talk “optimizing” if someone asks. They rarely ask. This is fine. Working on my anxiety levels has also helped with this somewhat. I visit libraries like it is my job. I always like a nice public place where I can sit and read or work among other people and not have to buy anything. I like getting ideas by looking at hundreds of books or flipping through magazines. Last night I was at the Tiverton Public Library which is just a few miles from my dad’s place in Massachusetts. They were having a speaker talk about Lizzie Borden. Fun! I found it via the Facebook “events near me” feature which I have never tried before since IN Vermont you usually get … nothing. The author, Rich Little (above), a math teacher at a local community college, had written a book called Cold Case to Case Closed, Lizbeth Borden, My Story. Fall River is right up the road and the place was PACKED with people, many of whom had a lot of knowledge about the case, some of which conflicted with the speaker’s. It was an entertaining 90 minutes learning more about the Bordens and about Fall River at that time. Mister Little used large blown-up images of the key players and I immediately thought “Uh oh, no slides?” but it turned out it worked pretty well in the packed room and we could all focus more on what he was saying. 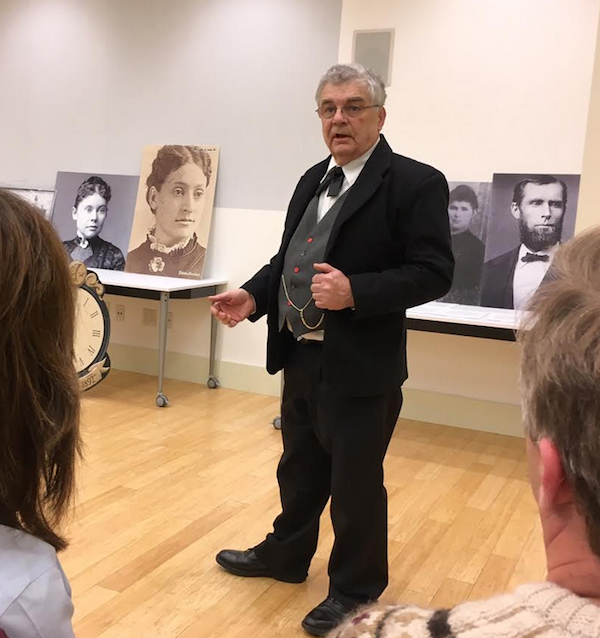 He was even pretty deft in dealing with the people in the audience who were pretty set against his interpretation of events (which seemed to be the vibe I got from the Lizzie Borden Society members reviews). I was pleased that I’d overcome my initial concerns to enjoy this great library program. One weird part, however, was RSVPing for the event. They asked you to call and RSVP. Not usually my communication preference but okay. I left my name, spelling it, and phone number with the library. When I arrived that evening the entire list of names and numbers (with mine written JAZMYN WEST) was on a clipboard in the front lobby on an unstaffed table. While I am pretty good at my “this is a thing on which reasonable people disagree” stance, I think this is a library privacy gaffe. At the same time, I don’t want my only feedback on this otherwise superb event to be “I felt weird that you left my phone number out in public.” so I decided to write all of this out.